Ecstasy, a popular term for an illegal, mood-altering drug whose chemical name is 3,4-methylenedioxymethamphetamine (MDMA). Ecstasy is often referred to as a designer drug. Designer drugs are produced in secret, unregulated laboratories to mimic the physical effects of common illegal drugs such as heroin. Designer drugs are sold illegally for a cost that is often far less than the drugs they are modeled after. The primary effects of MDMA include feelings of openness, euphoria, empathy, love, and heightened self-awareness. Its initial adoption by the dance club sub-culture is probably due to the enhancement of the overall social and musical experience. Taking MDMA or Ecstasy is commonly referred to as pinging, rolling, popping, peaking, rushing, buzzing, dropping, pilling, flipping, getting off-tap, eating skittles, jilling, or dosing. 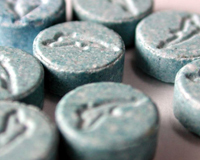 Some users employ practices to enhance the effects of MDMA, often called "Blowin' up". Because of the euphoric sensitivity to touch it is common, while on ecstasy, to have someone around the individual rub his or her fingers sensually and/or massage through the hair and scalp. Often times someone around the individual will flash lights on and off, use glow sticks--moving them in front of the individual vigorously--or spin the individual around, asking him/her to concentrate on one source of light. Because of the extreme intensity to colors, lights and touch this causes a 'sensory overload' to the individual, inducing an extreme sensation of euphoria. Chemically related to the stimulants known as amphetamines, MDMA was first synthesized by a German pharmaceutical firm in 1912, although it was never marketed for any medicinal use. In the United States from the early 1970s through the mid-1980s, MDMA was legally used in psychotherapy and was openly available via mail order. When used in therapy, the drug was observed to make patients feel less anxious and more open to feelings of understanding and acceptance toward themselves and others. In 1985 the United States government outlawed MDMA because it can produce dangerous side effects and it has a high potential for abuse. After MDMA was banned in the United States, drug dealers began manufacturing it in illegal laboratories and selling it under the street name ecstasy. The drug gained popularity in the late 1980s with the rise of raves—crowded, all-night dance parties usually held in secret locations such as warehouses. As rave culture spread through Europe, the United States, and other parts of the world, ecstasy became the drug of choice for many rave participants. In the United States federal sentences for ecstasy possession and sale have varied, but conviction for attempting to sell 200 g (7 oz) or more could result in upward of five years in prison, with higher prison terms given for greater quantities of the drug. Ecstasy is also illegal in a number of other nations, including the United Kingdom, Australia, Israel, and China. Because of its illegality, the dose and purity of a pill advertised as ecstasy may be stronger than is desired or may be unsafe. The use of ecstasy can exacerbate depression and may produce temporary depression as an after-effect for some users. Some individuals also might experience wild or unexpected mood swings the first couple of days following the use of MDMA. The use of ecstasy can be very dangerous when combined with other drugs (particularly monoamine oxidase inhibitors (MAOIs) and antiretroviral drugs). In many cases the ecstasy pills you may buy do not contain MDMA, but instead can be substituted with various substances like ketamine, methamphetamine and caffeine. Long-term after-effects are greatly exacerbated by high doses and frequent use. A small percentage of users may be highly sensitive to MDMA; this may make first-time use especially hazardous. This includes but is not limited to people with congenital heart defects, and a small percentage of people who lack the proper enzymes to break down the drug. The enzyme responsible for MDMA's breakdown is CYP2D6, which is deficient or totally absent in 5-10% of whites and African Americans and 1-2% of Asians.